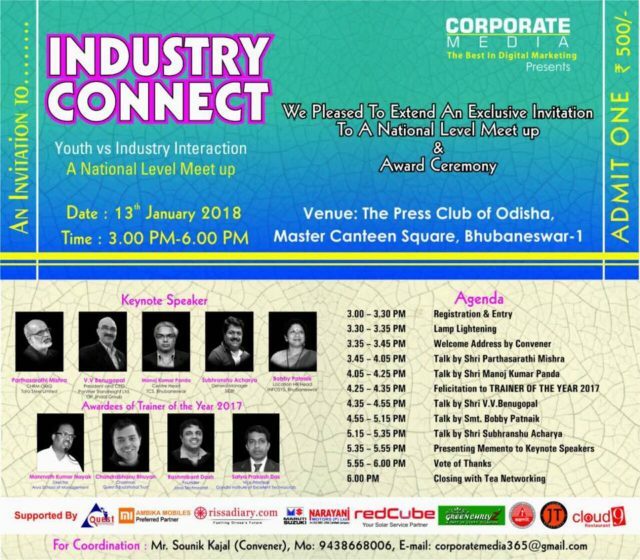 Bhubaneswar: First time in Bhubaneswar a private organization, Bhubaneswar based digital marketing company CORPORATE MEDIA is going to organize a national level seminar on INDUSTRY CONNECT on 13th January 2018 at PRESS CLUB OF ODISHA, MASTER CANTEEN SQUARE, Bhubaneswar at 3 PM. Around 200 youth participants including young entrepreneur, rising entrepreneur, industry experts, students, working professionals including faculty, management consultants are invited to attend the seminar. Sounik Kajal the Convener of the seminar told that Shri Parthasarathi Mishra (CHRM-OMQ, Tata Teel Ltd.), Shri V.V.Benugopal (President & CEO, Jindal Panther, OP Jindal Group), Shri Manoj Kumar Panda (Centre Head, Tata Consultancy Limited, Bhubaneswar), Smt. Bobby Patnaik (Location HR Head, INFOSYS, Bhubaneswar), Shri Subhranshu Acharya (General Manager-SIDBI) have given their consent to attend the program as Keynote Speaker. 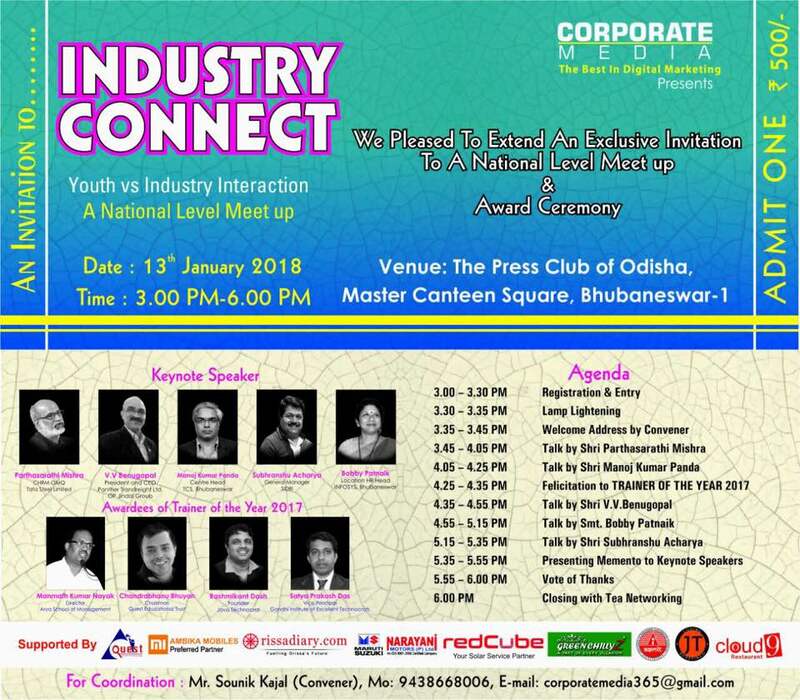 In this august ceremony Corporate Media will create a platform where youth of Odisha can have a direct interaction with the Industry Makers, where Industry Maker will speak about the Scope and Opportunity in their respective sector in the very next future. Corporate Media is a MSME registered organization has started its services in the year 2015 by providing Digital Marketing services, Printing Solutions and Business Strategy for educational sector, service based industry, manufacturing based industry, hospitality sector and others. In this program students and working professionals are going to attend the program from the field of engineering, management, science and technology as well.